Description - The Treyburne wood porcelain series boasts distinctive visuals & surface textures that look stunning in any room. Adding a classic, real wood look in multiple color options that can be mixed and matched for a unique look. Finished with rectified edging, these tiles can be installed with a thinner grout line for a more realistic look of a hardwood floor. Material – Glazed porcelain tile with Reveal Imaging and rectified edging. Size – Available as 6" x 24" and 9" x 36" tiles. 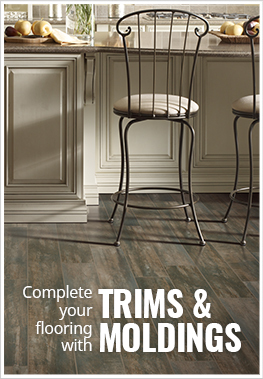 Application – Floors, walls & countertops. Case Weight – Each 6x24 case weighs ~46 lbs and each 9x36 case weighs ~58 lbs. Recommended Uses – Treyburne has been successfully installed in basements, hallways, bedrooms, kitchens, offices, museums, studios, entryways, cafes, closets, master bedrooms, boutiques, and more. I recently remodeled my house and redid almost all of the flooring. I got several samples of laminate and tile, but this floor was the one everyone kept stopping to look at - even with just the samples! I was a little worried it would look too busy because of all the color variation, but it came out unbelievably perfect! Everyone that comes into our house comments on the floor immediately. I swear the pictures don't do it justice - order the samples and you will fall in love as much as I did! Sometimes I still just stare at the floor because I'm so thrilled with how it came out. I definitely made the right decision! We were looking for a wood flooring for our basement but came to find that its trickier than just putting something down because of moisture issues and wood swelling. The wood tile gives us no problems and it look awesome - totally transformed the room.